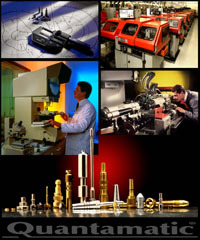 Quantamatic as a precision volume turned component manufacturer, based in the Midlands specialises in the manufacture of precision turned components between 0.4 and 8 m/m diameter. Our lean price policy is based upon high productivity/efficiency, fast component turn around, and continuous improvement through our ISO 9001:2008 Quality Management System. Quantamatic specialise in the use of Escomatic machinery. This cam-based equipment is designed for highly precise volume component manufacture in a variety of metals. Quantamatic offer a variety of additional services including holding stock on a call off basis, product design advice and the sourcing of heat treatment/plating services through approved subcontractors.